Oldest Pin: Camp Fire, it's old, i know! Activities: Hanging out with buds! How Often Do you Go On CP? Almost omg like all the time! everyday! Goes On This Flag: U.S.
Buddies in CP: i have so many! kimberrley1, sparkforever, spark6782, chucksmi, chuckleloo, tafantic, sand flipper, mega dude1, kanyewest, i have so many more and i didn't mention you, im sorry just theres like alot! Fave Motto/Blast: Whoo! or Hehe! Funny/Quirky Things: im very energetic! im funny! and i love being like crazy! while saying that go "moo!" aww thank you so much!!!!!!!!!!!!!!!!!!!! you just made my day and you gave me a birthday present! my birthday is in 4 days! HAPPY BIRTHDAY GOOFY73!!! Ya and you still didn't add me! :( Goofy is cool,yet! He didnt add me! I still can't believe it! It almost ruined my day! :( at least I got to say hi to Mimo777 that day! Ah yes! I made that post a long while back! Well, one thing, I love that joke! It has my nickname in it! :D Mooo! 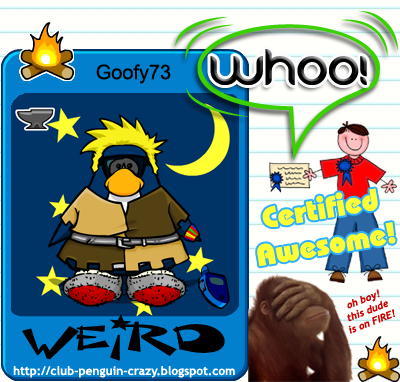 CPC Slumbook is a Special Section of Club Penguin Crazy Blogs solely owned and operated by Lady Maryann.